This is what San Francisco’s City Hall looks like today. Red for Valentine’s day and I imagine the first anniversary of our mayor’s now world famous action. UPDATE: I was so wrong. 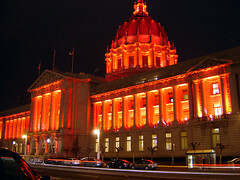 The reason City Hall was really red was the Go Red for Women campaign by the American Heart Association. My bad. Red for Valentine’s just made too much sense.